Immediate opening for a full-time Accounting Technician. 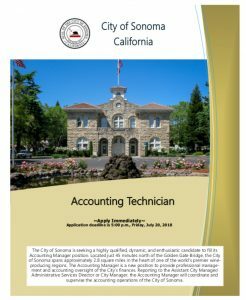 Performs a variety of complex and technical accounting functions in one or more assigned areas, including payroll, utility billing, accounts payable, accounts receivable, business licenses, and/or cash entries and deposits; provides technical support to the Deputy Finance Director and/or the or the Assistant City Manager/Administrative Services Director. Position open until Friday, July 20, 2018. City application is required and available to download, at City of Sonoma, No. 1 The Plaza, Sonoma, CA 95476, or by calling 707-938-3681. For more detailed information on the position, please view the Accounting Technician Brochure.